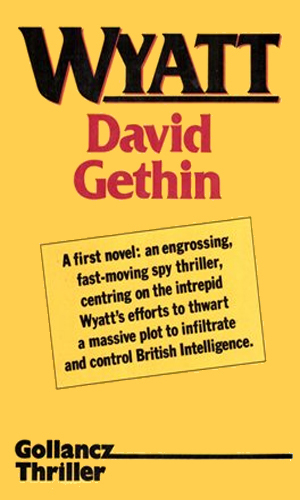 Wyatt is a former agent with British Intelligence. Having joined the British Army at a young age and becoming a member of the elite SAS, Wyatt was convinced to go to work for the British spymaster Phillip Moresby. For over a decade, he performed admirably and with great distinction, earning the respect of his peers as well as his commanders. One particularly difficult mission was finding the kidnapped son of a small, oil-rich Arabic country's ruler. Having gotten the young boy out safely under tremendously adverse conditions, Wyatt was richly rewarded. While Wyatt had never asked for nor expected the largesse, he was smart enough to accept it. Suddenly with unexpected wealth and tired of putting his life on the line, Wyatt quit the Service and started Aberinvest Corporation which began to put a large amount of his money into various enterprises, especially companies that had fallen onto hard times and which needed cash to get them back on solid ground. Choosing people as good to work with him in the board rooms as those he chose to fight alongside, Wyatt turned a small fortune into a very large one within another decade. In his late thirties with more money than he would likely ever spend, tired of the hassles of corporate life just as he had tired of the dangers of his covert activities, Wyatt chose to turn day-to-day operations over to his managers and retire to the beauty and relative quiet of western Wales and the beautiful estate he had purchased. That is where Wyatt is at the start of the recorded adventures. 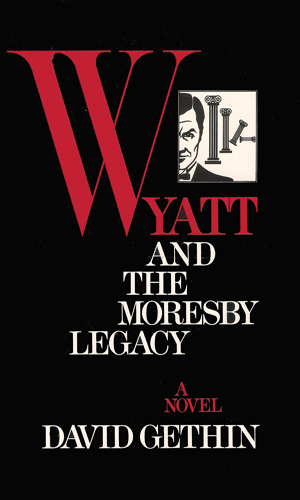 He had no desire to leave Wales and definitely no desire to get back into the thick of intrigue, danger, and worse but then a lawyer just beginning work with Wyatt is gunned down on Wyatt's estate and Wyatt learns right after that his old friend and mentor, Moresby, has been arrested for treason. Suddenly, standing aside and playing it safe do not seem like options Wyatt can live with. Wyatt undoubtedly has more to his name that just Wyatt but more is never revealed. Wyatt is his last name but everyone treats it like a first and he obviously prefers it that way as he corrects one or two who called him Mr. Wyatt to just use Wyatt. Wyatt is helped in the three-book adventure series with several interesting and enjoyable characters. Johnny is a refugee from a Balkan country who understands the treachery that the Soviet Union is capable of and is capable of countering it when needed. Ko is a Dayak who stands 5' high and almost as wide, an expert with a machete and able to move swiftly and silently when needed. Fallon gets motion sickness in the air and on the sea but in a boardroom he can command like few others. These men are the three main companions of Wyatt but there are others and show continuously why Wyatt is able to not only survive but usually succeed at whatever he endeavors. Two days after Sir Phillip Moresby of British Intelligence is arrested for treason, an attack on Wyatt's estate results in the death of Wyatt's lawyer. Now Wyatt, convinced that the arrest of his old mentor and friend is connected to the attack, goes on the offensive. A token left on the grave of his old friend, Moresby, provides evidence that Wyatt was still alive, despite the way things appeared. Now some in British Intelligence have need of such a capable man while others are determined to see him permanently dead. 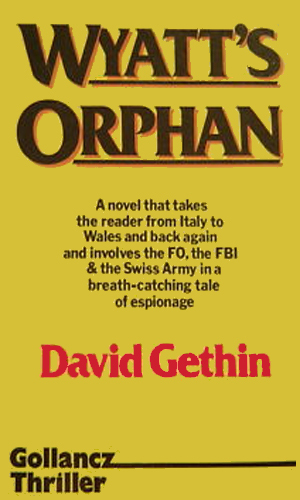 -preliminary - A novel that takes the reader from Italy to Wales and back again and involves the Foreign Office, the FBI, and the Swiss Army in a breath-catching tale of espionage. I read the first book in the series so fast it almost made my head spin, it was that good. I made sure the second was close at hand as I neared the end of the first and was pleased to put down the first, smile with pleasure at how enjoyable it was, and then pick up the second and move on. The third had not yet arrived at my mailbox by the time I finished the second, two days later and that was sad. Wyatt is not a spy anymore, or so he claims, but the adventures are rooted firmly in the intelligence community and Wyatt fits in quite well. The author switches a few times from third person to first person as told by Wyatt but the conversions are made obvious by the use of darker, bolded print when Wyatt is telling the story. I usually do not like switching but this definitely worked just fine. I would have liked more books about Wyatt. I got three. I am greedy and he is that enoyable.